You are here: Home / Employee Engagement / Engagement: To Bee or not to Bee? Engagement: To Bee or not to Bee? 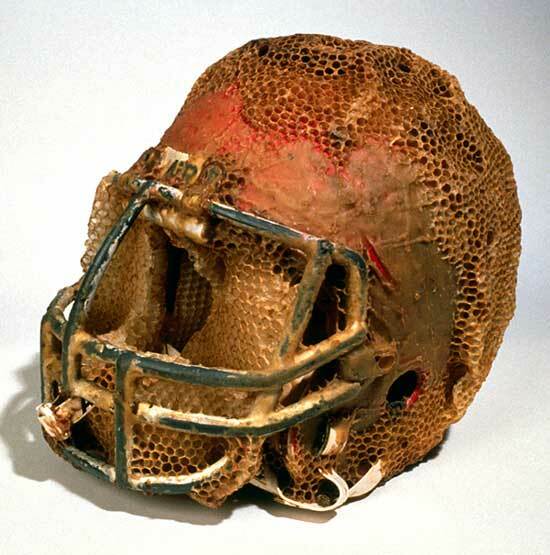 When you work with bees a football helmet can become a lens or sculpture to see the world in a much richer way. I had the honor this week of sharing breakfast with Aganetha Dyck. Sometimes referred to as the “bee lady,” Aganetha won Manitoba’s Annual Arts Award of Distinction. I have wanted to talk with Aganetha for quite sometime as I believe her work with bees has clues or responses to foster employee engagement in the workplace. Aganetha is able to think differently inside the hive, to follow her passion even when others are left wondering about her artistic expression, and she maintains a commitment to lifelong learning. 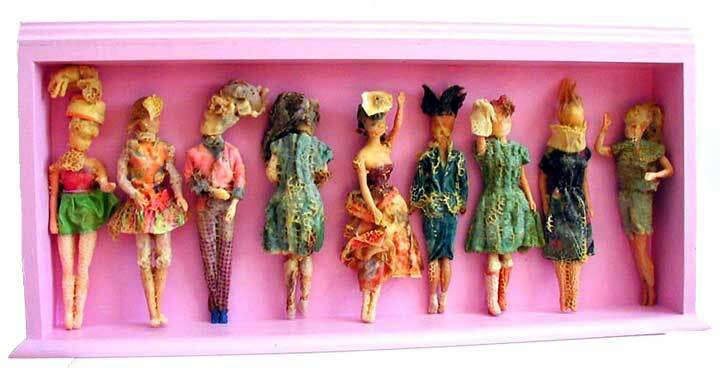 If you would like to see more pictures of Aganetha’s art you can visit her site by clicking here. I hope you will take the time to look at the sculptures that Aganetha co-created with bees. To demonstrate and confirm her collaboration with the bees, the art is now signed by both the bees and herself. If you are a leader in the workplace is the work of your team both a signature of yourself and the people you lead? The first lesson I learned about trying to engage bees in art from Aganetha was how engaged she was by the bees. I believe I may have learned more about the bees in our hour together than I did about her. She loves bees and she loves to learn about them. This includes even learning about the darker sides of their behavior. I did not sense a judgement about some of the bees “darker behavior” rather I sensed a richer and more complete understanding of her artistic partners. Before we look at fostering employee engagement we must ensure we are engaged with them. Have you learned all you can about the people you work with? Aganetha uses a variety of methods to engage the bees with her hive-offerings. She is constantly learning. She has experienced a number of successes yet at times the bees have not engaged in a work she offered. I believe in engagement we must look at the work we are asking people to do and must accept at times that the work does not engage them. We may need to change assignments or alter methods. How do you respond to others who don’t engage in their work? Do you maintain your engagement with them? How flexible are you in helping people engage in work? Aganetha has been surprised and delighted by some of the work the bees have performed. She thought they might work in a predetermined way yet was able to see the art and contribution of the bees in ways she had not anticipated. Are you open to being surprised and delighted by the people you work with? Aganetha is genuinely concerned about the welfare and future of bees. She is developing plans to give back to the bees what they have given her and to have people understand how important bees are to the survival of the planet. How do you express your gratitude for the people you work with? Aganetha is so absorbed in her art. She told me about drawing an image of slightly deformed 3-legged bee that she discovered in a very old book on bees. Not only is she drawn to the image, she draws this image everyday. Are you able to engage in your passion everyday? Do you have the gumption and tenacity to stick with it? Unfortunately I can’t resist bad puns, or any puns for that matter. I could drone on and on but what I hope is that you catch the buzz and see your work in employee engagement as more than performance management. Employee engagement can be the calling forth of artistic expression for yourself and the people you work with. Normally “Get Engaged” offers tips or questions. Today, I encourage you to look at one of my favorite works by Aganetha, Pivot. What do you see? When it comes to employee engagement are you able to think creatively inside the cubicle? Here are a few comments Aganetha added about her work and the bees. Hi David, I find it amazing how you were able to place your 7 ideas of engagement with the bees and within my artistic practice with the bees. I feel honored to have you recognize the value of the bees and my collaboration. The bees pollinate from 30 – 50% of our global food supply. The bees are an international pollinating workforce for the entire planet. Having said that it is estimated that if all the bees died, the world would have 5 years of the food supply it now has. The value and importance of wild and apiary bees amidst our earth appears under rated. To date 95% of global wild honeybees have died due to the many diseases presently affecting honeybees. The use of pesticides and insecticides is harmful to many beneficial pollinators. Plus our apparent desire to cut down all grasses along highways, railroad sidings, parks and meadows depletes colonies of wild and apiary honeybees. I think it is imperative that we encourage the wild bee population to thrive once more. One idea which comes from Dr. Mark Winston, internationally recognized expert on the honeybee, is that we leave the roadsides, railway sidings and any land not being farmed to grow freely with the wild indigenous plants of the areas. We could also consider scattering wild flower seeds as we walk about this earth, keeping in mind to scatter seeds which are, again, indigenous to the specific area we walk in. I enjoyed your questions. They are a powerful way to get at the juice in our work relationships. Creating work environments that are life-affirming and humancentric is very valuable work. Thanks, Aganetha, for bringing such poignancy and urgency to artmaking, and to those who see it. From reading your comments here, I suddenly have a huge respect for bees. I had no idea how important they are for all of us. I am going to see your exhibition at the Burnaby Art Gallery tomorrow, and I look forward to hearing you speak about your work.